Shearwater Cove is home to four yurts. The three larger yurts can accommodate 2-4 guests, and the fourth, smaller yurt can accommodate 1-2 guests. 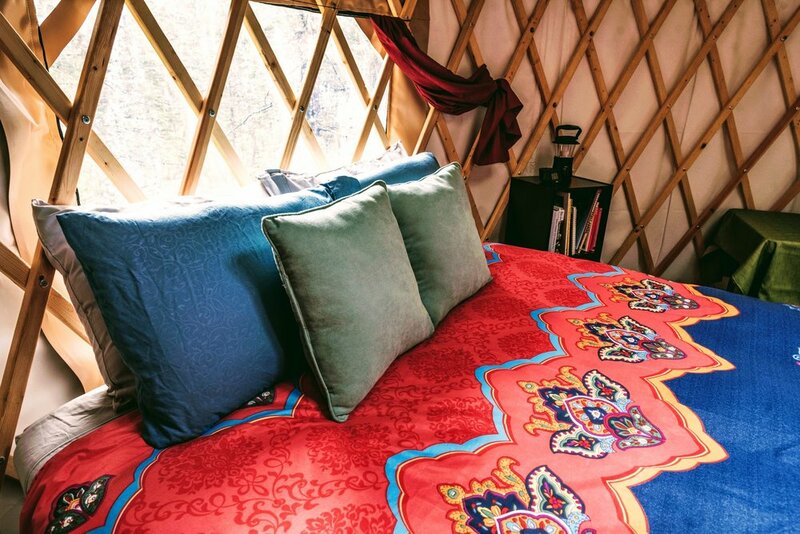 Each of the yurts is comfortably furnished and equipped. 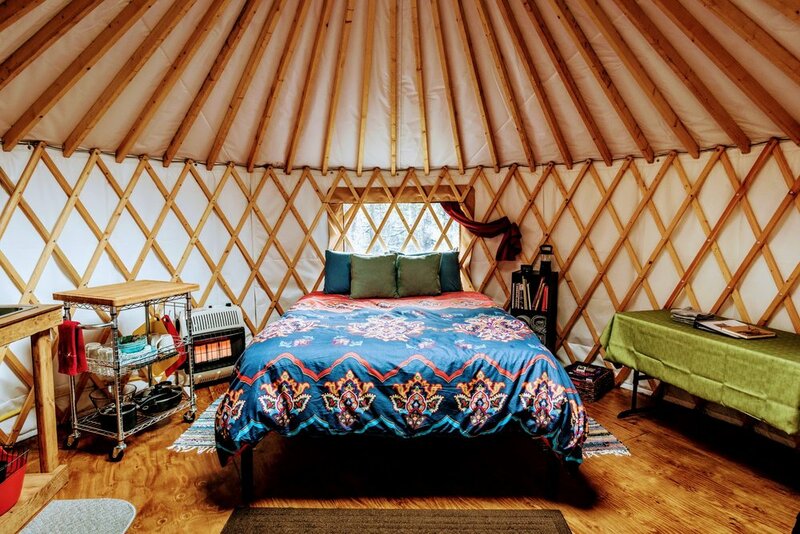 The larger 2-4 person yurts have a queen memory foam bed and full size sofa bed. The interior is furnished with a table and four chairs for dining, a heater, and a small kitchen with a propane range and sink with hot/cold running water. On each deck is a private bathroom which houses the shower and composting toilet. The smaller, 1-2 person yurt is also furnished with a queen memory foam bed and table with two chairs for dining. On the deck is a private, covered kitchen area with a propane range and sink with cold running water, as well as a private rest room which houses the composting toilet.This yurt does not have a shower or hot water. 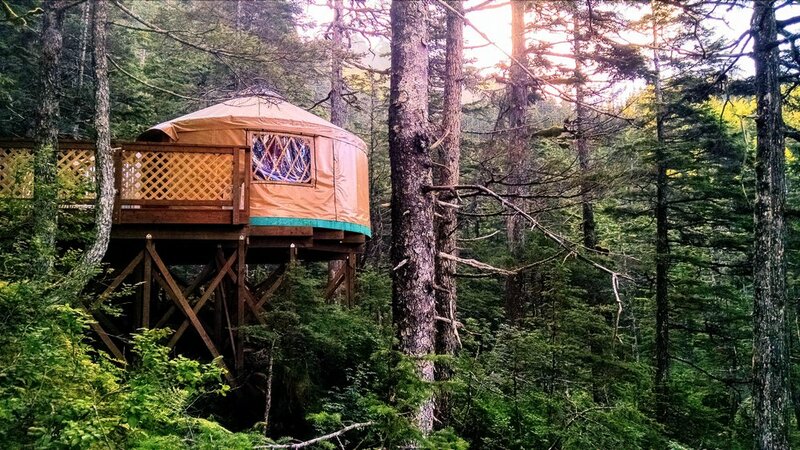 This yurt offers a slightly more rustic experience, yet has the closest oceanfront view. The yurts are stocked with the following items to make your stay more enjoyable. Fresh linens, pillows, comforter, and blanket. Please use these products in place of your own to protect our sensitive environment. Two burner propane range for cooking and sink with running water. Dishware and cutlery including pots, pans and a french press for coffee. Cooking basics such as salt, pepper and olive oil. A selection of books, magazines, field guides and board games for indoor entertainment. Shearwater Cove is located in a remote wilderness setting therefore there are no food services nearby. Guests must plan ahead and bring their own food. We do provide drinking water.